An interior decorating & lifestyle blog documenting tips and inspiration for people with a passion for interiors. As a designer, one of the questions I hear from clients on practically every consultation is “how do I arrange my furniture in this space”? Arranging furniture so that it can fit the room nicely, serve it's function, sometimes multiple functions and, maintain good traffic flow in a room can be challenging. When looking for ways to arrange your furniture, it is always best to follow certain basic guidelines. Always make your focal point the center of attention, and always keep the principals of balance, visual weight in size and scale, and the rooms dimensions, function(s) and traffic flow in mind. This is a critical first step to ensure that all the different furniture pieces that you will be bringing into the room will fit the room nicely. A quick and easy way to map out your rooms dimensions is to measure the length and width of your room and, then record these dimensions on a sheet of graph paper. Each square can be recorded as one square foot. Measure all your furniture and record the dimensions on the graph paper as well. Try to avoid pieces that are too large for smaller rooms and too small for rooms that are of a gander scale. If something does not fit, don't bring it into your space. Measuring the length and width of your room before you go out and buy furniture or start re-arranging furniture will save you both time and money. Every room must have one and, when you are arranging your furniture, it is always best to arrange it around your rooms focal point. You must make your focal point the center of attention. It does not matter where you place yourself in the room, while you are in the space, your eyes should always naturally fall on the rooms focal point. Some rooms have natural focal points. 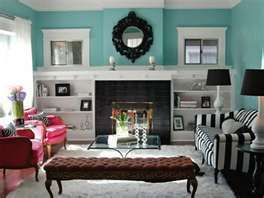 Living rooms for example may have a fireplace or a large window. A natural focal point in any bedroom is the bed. The focal point in a dining room need not always be the table. It can be a fireplace, or a feature wall where art work is hung. When you are arranging your furniture, asking yourself what is the focal point of this room is always the best place to start. If you do not see a natural focal point, you must create one so that all the activity that will be going on in the room will center around it. chandelier hanging in the middle, keep all focus on the focal point and help create high drama in this beautiful space. 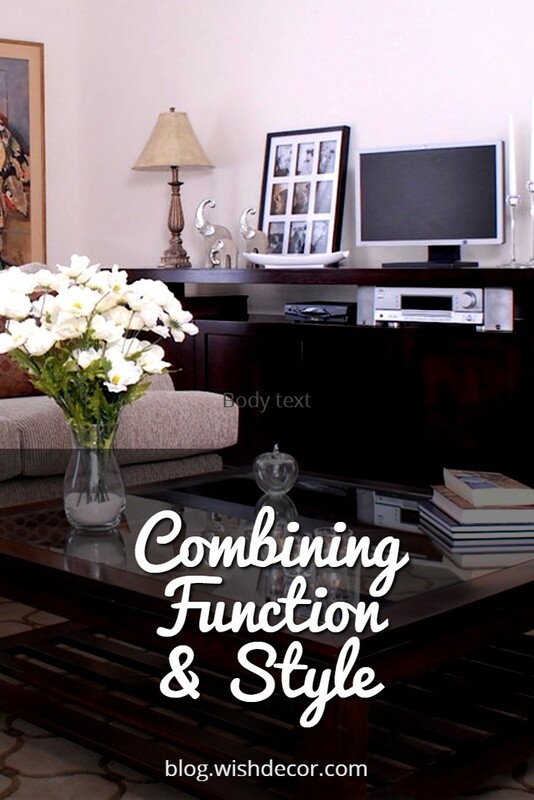 Once you have determined your rooms dimensions, function(s) and focal point you can start placing your furniture. Your goal is to place your furniture around your focal point in such a way that it creates a sense of balance in the room in order for all the various components in the room to live in harmony. You need to consider balance in two ways. Firstly, the balance in how the various pieces in the room will be placed. Secondly, you want to consider the size and visual weight of each piece of furniture. When I look at creating a balanced layout for my clients, the simplest place to start is by drawing out a room and then dividing it into four equal quadrants. Think of these quadrants as a balance scale. If one quadrant has too much weight compared to the others, you will feel a “sinking” feeling each time you are in that area of the room. I then ask myself how much visual weight do the individual pieces of furniture that I will be putting in the room carry. The amount of space that a piece of furniture appears to take in a room usually has to do with its color, design and structure. White chairs or couches for example appear visually lighter than black ones. Glass tables appear to have less weight and take up less space in a room than wooden ones. Therefore, to create balance in all four of your rooms quadrants, always spread out your “heaviest” pieces of furniture as evenly around the room as possible. If you have mainly large pieces, you will need to balance them out with smaller ones. For example, if you are placing a large sofa in one quadrant, try to place two chairs or a piece of equal visual weight on the wall opposing it as shown in the example below. In addition, try not to place too many pieces clumped together in the same quadrant leaving other quadrants empty or with few or little pieces to balance the scale. In the above example, our designers placed a media console as well as bookcases and accessories around the four different quadrants of this living room to keep each quadrant in balance with the other. When trying to create a balanced layout remember to always place the “heaviest” pieces, the pieces that carry the most visual weight down first. By doing this, you will have a better sense of the rooms structure. Once your structure is established, the smaller pieces fall into place quite easily. Keep in mind also, that doors and windows also carry visual weight so you don't need to place as much furniture in areas that contain them. In terms of design, the term scale refers to the size of an object in relation to another object in the room, or in relation to the room itself. A large dining room for example, needs to have a large dinning table. If it had a small one the table would look out of scale in the room. Similarly, placing a small coffee table in front of the long couch would also seem out of scale. When you are considering scale in design, unity is your aim. Try to avoid to many contrasts in height and visual weight. Similarly scaled pieces are more serene when used together but, a nice balance of pieces will create a harmonious atmosphere. In this example the designer has used scale wisely to make this room visually interesting. The conversation area in this living room contains two chairs of the same size, shape and color that are grouped together opposite a large sofa. Two table lamps are placed symmetrically beside the large sofa and there are two built in bookcases and two windows on either side of the fireplace creating a sense of balance. The long rectangular bench adds great interest because it echoes the long horizontal line on the fireplace across from it and, the frame of the bench relates very nicely to the style and shape of the sofa and chairs. Once you have considered the scale of all your different pieces of furniture, your next step is to consider the axis of your room. In design, when we speak of a rooms axis we are referring to the elevation of the room. In general, the focal point should dominate the eye from floor to ceiling. For example, if the focal point of a room is a fireplace, you will commonly see a large mirror or a piece of artwork placed above it as shown in the examples below. Designers do this to first draw focus to the fireplace, and then extend the eye upward extending the axis up the wall. Once you have created and established the axis on your focal wall, you will want to place objects on the axis of the opposite wall in the room. This will also help to balance the room. Try to use objects of equal weight as they should be high enough to establish their own axis. If you are arranging your bedroom for example, you could draw attention to the bed as a focal point by putting art work above the headboard. Then, on the opposite wall, place your dresser with a large mirror over it. In the example below, attention is drawn to the bed with three pieces of framed art that are placed above the headboard. The art helps to extend the height of the headboard and thus, help finish the axis line all the way up the wall. The large elevated scale is repeated on the opposite wall where the designer has placed a larger piece of art work along with two sconces above the fireplace. The placement of the bed across the fireplace and, the art placed on the walls on both sides help to extend the axis of these two walls all the way up from floor to ceiling in perfect balance and symmetry. 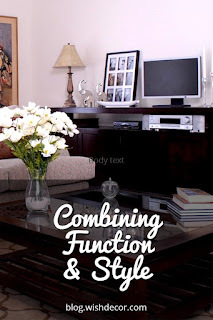 When designing a furniture layout for my clients, it is equally important for me to know where not to place furniture. 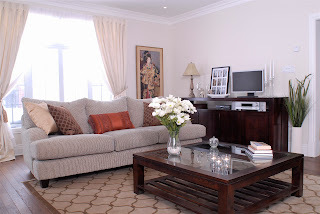 Therefore, your next step when you are arranging your furniture, is to consider your rooms traffic patterns. Traffic patterns are embedded lanes in each room that allow people to flow through. 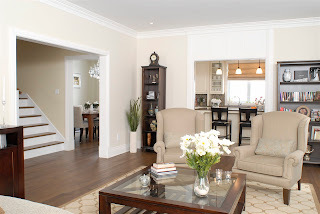 You should always take into consideration when placing your furniture that you must leave 36” in front of door openings and allow room for the doors to swing open. Keeping 12” in front of windows will allow people to open and close them. You would also like to keep the hearth of a fireplace clear. In conclusion, knowing where and how to place furniture in any space is made easier by keeping balance and scale in mind. They are the fundamental concepts of design that designers and decorators use when they begin to visualize a layout for a room. As you start laying out your floor plan remember that variety is the key to a successful and interesting furniture layout. Try to avoid lining up furniture against the walls all around the room or placing it directly perpendicular to the walls in hopes that you will gain more space and that this will make the room feel larger. Instead, pull the furniture away from the walls and try different and interesting angles. By pulling the furniture away from the walls, you will instantly add more drama and interest and, the room will feel fuller and therefore bigger. Arranging furniture in a “U” shape pattern for example allows everyone seated in the room to face each other while they are socializing. It creates a comfortable and cozy conversation area. Always remember to start with your focal point and make it the most dramatic part of the room. Your furniture should be arranged in such a way that it emphasizes the focal point and, that it is balanced throughout all the four quadrants of your room. There should be a variety in how you place different pieces around your space. Try not to place all the heaviest pieces, or the pieces that carry the most visual weight together. Always make sure that the furniture arrangement does not interfere with the traffic flow of the room and remember to finish off the sense of balance you created with the furniture layout by addressing the rooms elevation or axis. This will give your arrangement the finishing touches it needs and, give it that designer unity and harmony that you are seeking.